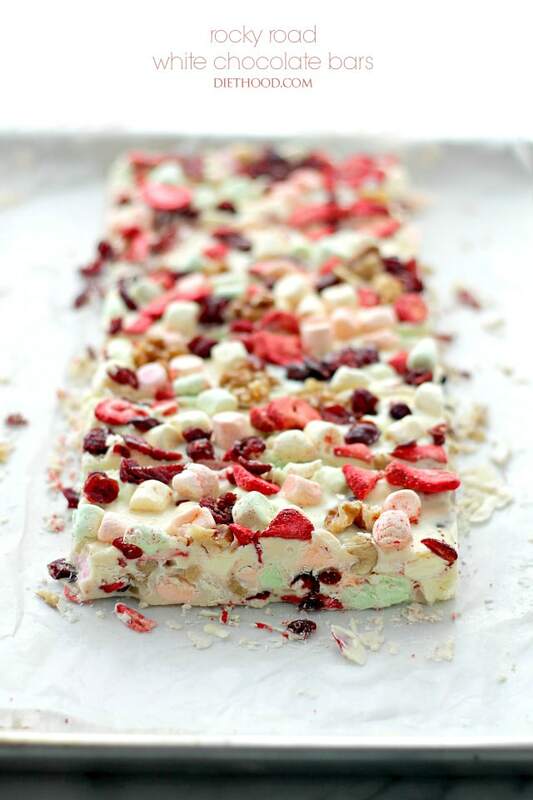 Rocky Road White Chocolate Bars – Marshmallows, strawberries, nuts and cranberries all covered in deliciously sweet white chocolate. 37, I love YOU already! We’re *this* close to 40! Um… WHAAAAT?! I’m closer to 40 than I am to 30? THAT is so weird, especially because I am SO 23. You guys! As if the title didn’t give it away, today is my birthdaaaay! We’re celebrating with chooooocolaaaate! <—- use Oprah voice when reading. Can I just ask one thing? This getting older thing… Am I supposed to be getting wiser, too? Because, since having little ones, I feel like I lost a few marbles. Maybe we should just move on to chocolate and stuff, ha? No problem! This is my birthday dessert. THIS is what I want. I LOVE cakes, I really, really, do, but something about these chocolate bars… well, I’m very much down with dat! I WISH I had a candle to put right in the middle of it all and sing Happy Birthday to myself. I would! I especially like the part where I get to snag a few more bars than everyone else because, well, hello? It’s MY birthday! Not too long after taking this picture, she reached over and snagged 2 chocolate bars from my stash. 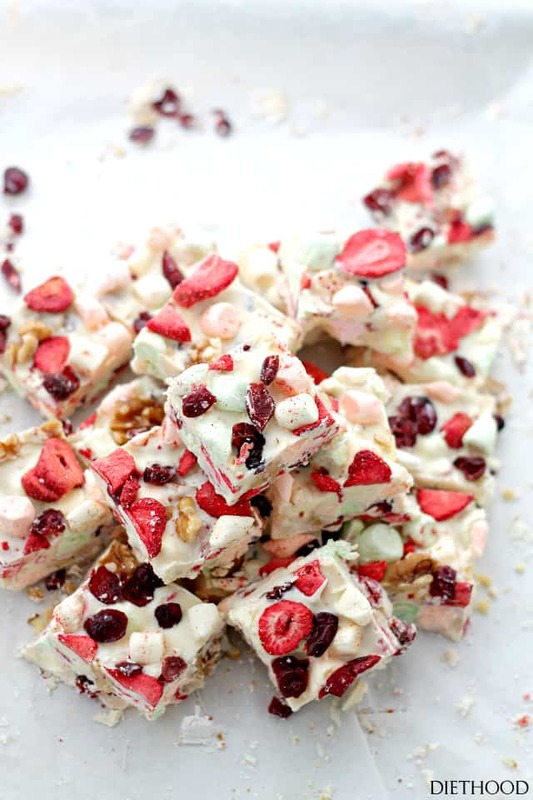 Sooooo, I’m gonna go now and celebrate my day and you should go and make this deliciousness ASAP because, a) no bake, b) quick & easy, and c) delicious! 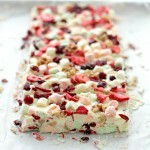 Marshmallows, strawberries, nuts and cranberries all covered in deliciously sweet white chocolate. 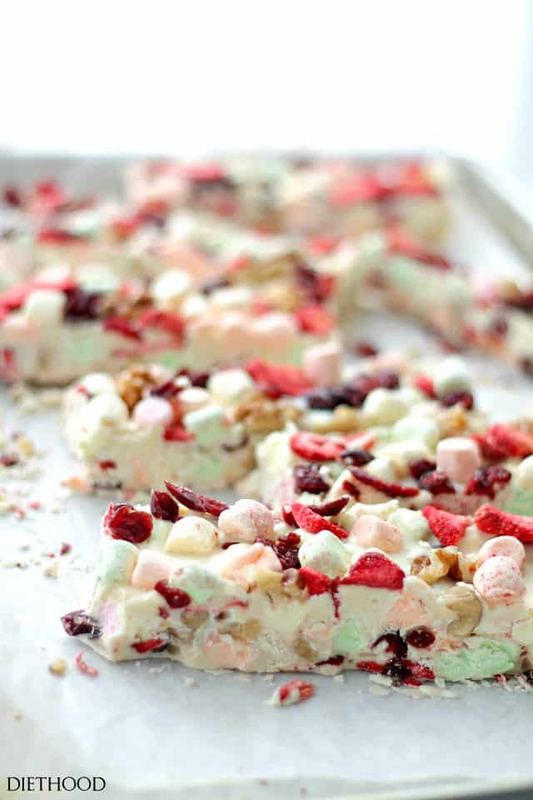 In a mixing bowl combine marshmallows, walnuts, cranberries and strawberries; scoop out 2 cups and set those aside. Line a 13x9 baking pan with wax paper, leaving a two inch overhang on opposite sides; set aside. Set up a double boiler by filling a saucepan with about 2-inches of water. Bring to a simmer. Place a large mixing bowl on top of saucepan (one that will not touch the water on the bottom) and add white chocolate chips and vegetable oil to the top bowl. Stirring frequently, cook chocolate chips until melted and smooth. Transfer chocolate mixture to previously prepared baking pan and smooth and mold with a buttered spatula. Sprinkle the remaining 2 cups of the marshmallow mixture over the top, gently pressing down with your palms. Place the pan in the refrigerator for 4 to 6 hours or until completely set. Overnight is best. Using the wax paper overhang, lift out of pan and place on a cutting board. Using a sharp knife, cut into bars, cleaning the knife blade in between cuts. Can be made 1 week ahead. Keep in a cool and dry place. I would love to make this for christmass. I was wondering though, how much grams chocolate did you use? Because when I convert 36 ounces it says it’s 1kg and 20 grams, this seems much. Or for how many persons did you make it? I made this a couple of days ago after seeing it. Its easy and delicious,very rich though. It looked exactly as the picture. Happy Birthday + I feel ya!! I’m still closer to 30 but it’s so strange how not much else has changed. I always expected to be all grown up at my age but no! I’m still as goofy as I have always been… These chocolate bars are to die for mmm!!! I think this is the third post I’ve said this in but happy birthday! 😀 These bars look so, so good! HI Lauren!! It took me 3 days and 4 stores. I was determined! 😉 I found them at Walgreens, and it’s that Delish brand that they carry. Happy Birthday to YOU! These are fun and I hope you enjoyed the heck out of them! And yes…we do loose our marbles after having kids…totally but you know what its SO worth it! Cheers to a year full of good things! Happy Birthday Girl! The best is yet to come! You little one is precious and …. you made a mighty nice treat. Happy Birthday! Happy birthday, Kate 🙂 I hope you had a great day! It’s a good birthday week – mine is Friday. These bars are a great way to celebrate. Sweet and easy to make! Perfect treat for a birthday! Happy birthday!!!! Hope it’s been awesome! HAPPY BIRTHDAY! These look like the perfect way to celebrate! And you also had me at no bake! Can’t wait to try these! Happy Birthday! Such an adorable little helper you have!! 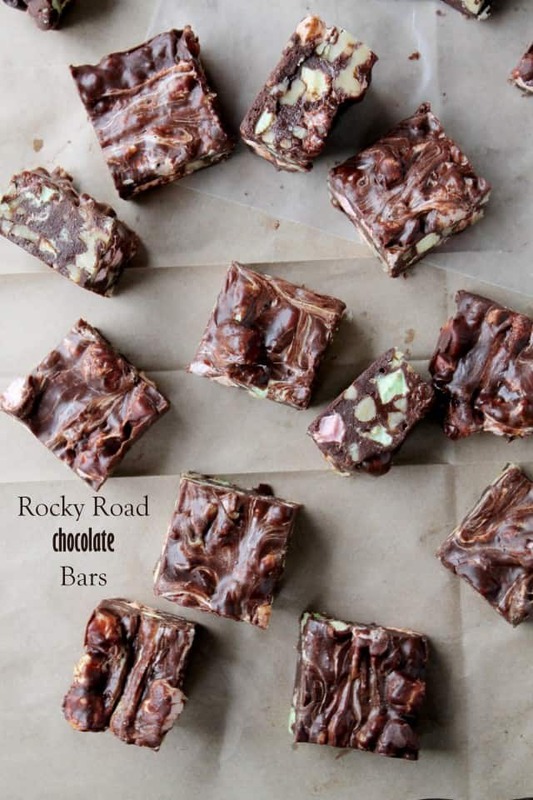 And these bars are out of this world – gorgeous! Pinned! Happy 20th Birthday sweet friend ;)! Hope you have a wonderful day especially with that little one. Happy Birthday! 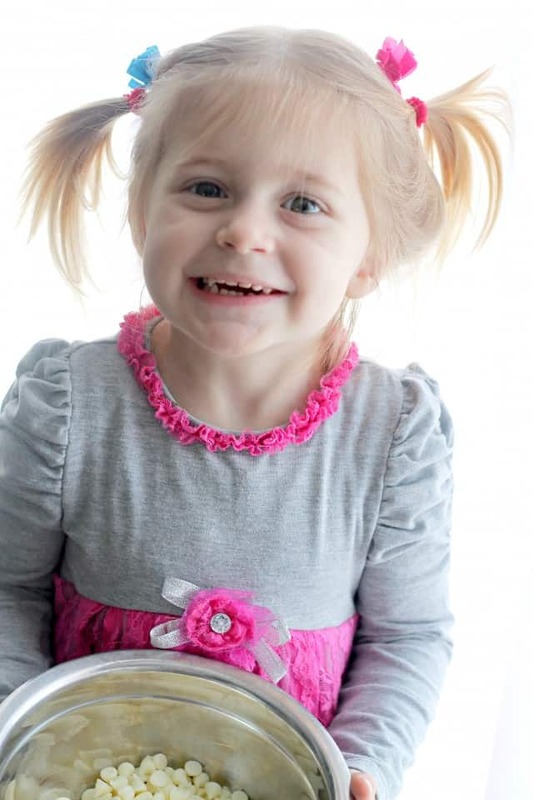 And I’m not just saying this, your daughter is adorable! Enjoy your day, with wishes for a wonderful year ahead. HAPPY BIRTHDAY TO YOU!! !…AND MANY MORE!!!! 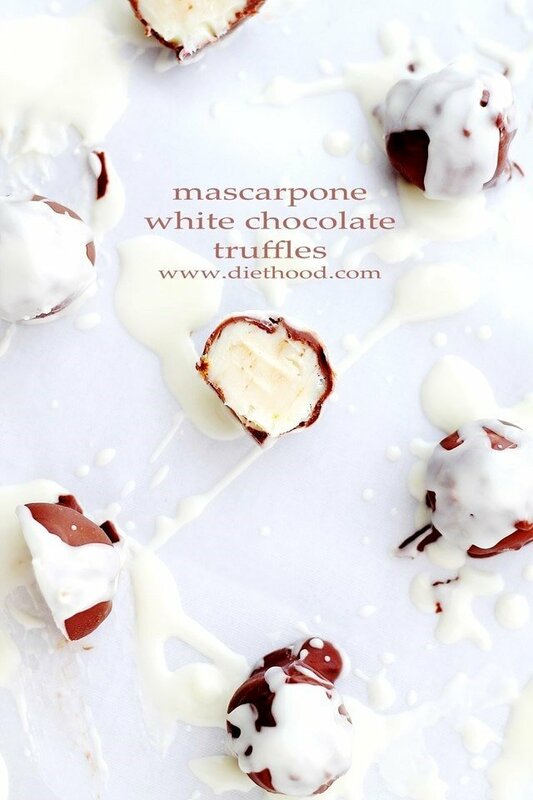 You had me at white chocolate. This looks soooo good! Happy Birthday…mine is this week too. Thank you, Robin!! Happy early birthday to you, as well!